The kubectl command line is great, but sometimes it's nice to have a dashboard to click around and see basic graphs, view logs, etc. 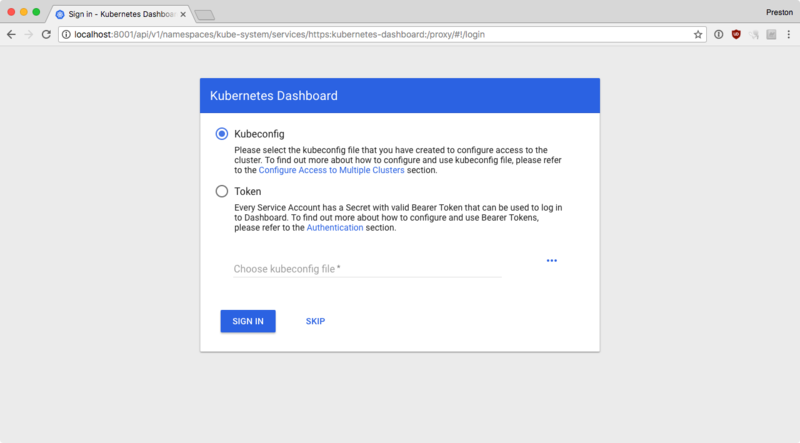 Out of the box, new Kubernetes clusters (I am using Google Kubernetes Engine here) have legacy authentication disabled, and RBAC is required. Having used Kubernetes prior to this, it wasn't clear to me how to access the dashboard with RBAC. To begin, simply spin up the Kubernetes Proxy with kubectl proxy. Then, access http://localhost:8001/ui in your browser. So, once you get to this screen you need to pick a method. It wasn't obvious to me which one to pick, or where to get the information from, which is why I'm writing this post. I tried using my local Kubernetes config ~/.kube/config, but it didn't work for some reason. Also, this might be undesirable if you have multiple clusters, since you don't want to share your access tokens with a single dashboard instance running on a single cluster. Simply copy and paste this into the browser after selecting the Token option, and you'll be logged in to the Dashboard with your personal RBAC credentials. Enjoy!